Every first day of Chinese New Year would mean paying a visit to the home of the matriarch of the paternal side of my family, my great grand aunt. 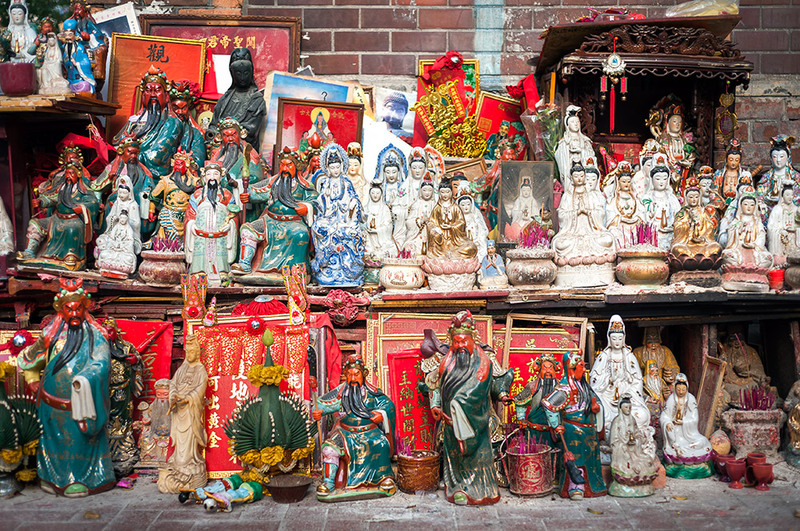 I used to be fascinated by the images of the Buddhist and Taoist deities placed on top of and below the family altar. I guess its placement indicated the importance of the deity in the hierarchy of that pantheon. One particular year, I noticed a distinctive change in the altar arrangement. It was the placement of a strange looking ‘deity’ among the other more familiar personages. Surprisingly, it was a photograph, not a painting, of a chubby cheerful-looking Indian man with a large afro hair-style, placed at the very center of the altar top. It triggered my innate curiosity. My mother, being ever so intuitive, frowned and forewarned me not to ask any silly and embarrassing questions. My father, clueless as ever, blurted out, “Who is that man in the picture?” My great grand aunt quipped, “Oh, He’s Sai Baba. He’s a powerful miracle worker, a God worshipped by many of his devoted followers.” I must confess, he looked more like a cuddly teddy bear. The following year, I noticed that the photo-portrait of this god-guru had been relegated to an ignoble spot beneath the altar and in the year thereafter, the photograph disappeared altogether and was never seen again. I guess this god-guru had proven to be a serious let-down to have been booted from great grand-aunt’s list of deities to be honoured and worshiped. This whole little episode got me thinking. How easy it is for people to look for a god that fits the bill, who meets their expectations for prayers answered, disasters evaded or financial crisis resolved. But the soonest they discover that this deity no longer serves their purpose, they are ever ready to change alliances; some even changing gods as frequently as they change their underwear. This little story is not intended to belittle non-Christian beliefs or dismiss them all as superstition. The purpose in telling this story is to highlight the point that it is often so convenient to make God fit our bill of expectations, to make Him in our own image and likeness. So many, “Christians” included, have created a god in their own image and likeness, a God that sounds like them, think like them, and even feels like them. This is a convenient God to worship, especially when he agrees with your lifestyle, when he tolerates and exonerates what the Church condemns as sin. Unfortunately, there is almost no end to this ridiculous god-making because there is always some new crime or sin that needs to be justified. This is a God who makes no demands of you and doesn’t expect you to change. Rather it is those who hold on to their antiquated scriptures and magisterial teachings who must change. How convenient? However, the truth is that our God does make demands of us. In the call of Our Lord Jesus Christ announcing the coming of the Kingdom of God, the clarion call to change is made, “Repent and Believe in the good news!” Being able to change is simply part of being a Christian! True, but it is too bad the vast majority of “Christians” don’t see it that way. The truth is, it’s tempting to co-opt the Lord and His message. The re-envisioning of Jesus is most obvious when it violates actual historical fact, but there are countless subtler versions of the same distortion. There is the Jesus who welcomes sinners and celebrates their lifestyles without asking for change. There is the warm and fuzzy Jesus who only teaches love and mercy, a mercy that doesn’t require repentance. There is the self-help Jesus who came to motivate you to be the Best-You. There is also the Jesus who understands that your personal happiness is paramount, and others are secondary, when you choose to get a divorce or an abortion. And then, there is the radical social-justice orientated Jesus with a political economic revolution to lead. Not surprisingly, most of these Jesuses look much like the Christians promoting them. It is good to take heed of the wise advice of St. Augustine, who said that “if you comprehend, it is not God. If you are able to comprehend, it is because you mistook something else for God. If you almost comprehend, it is again because you allowed your own thoughts to deceive you” (Sermon 52, 16; see also Sermon 117, 5). Our supposed knowledge and perception of God, which is freed from Divine Revelation, is often prone to self-deception. In today’s first reading, we accompany Elijah, as he encounters the God of Surprises. Elijah had just won a great victory for the Lord on Mount Carmel but it proved to be a Pyrrhic one. No sooner had he defended the reputation and dignity of the God of Israel over the false pagan god of the evil queen Jezebel, the latter threatened to have him arrested and killed. He fled into the desert where through the ministration of an angel, he was led to this mountain, the scene that we had just heard in the First Reading. He had confronted the false gods of the pagans on the other mountain. But now, he must confront his own demons, his own false images of God on this mountain. He has to silence all his internal voices and put aside all his presumptions that tell him what God is like so that he can receive God as God is. Once Elijah has met God on God’s terms, and not on his own terms, he is open to hear the truth, which sets him free from illusion. God sends him on his last mission to appoint a successor, the prophet Elisha. In the gospel, we have another incident of mistaken identity that needed to be corrected. The miracle of Our Lord Jesus Christ walking on the water, recorded in three of the Gospels, came on the heels of His miraculous feeding of the multitude. It was the miracle of Jesus walking on the water that, more than any other, convinced Jesus’ disciples that He was indeed the Son of God. But this recognition did not come immediately. In fact, when the disciples initially saw the Lord walking on the lake, they thought He was a ghost levitating above the surface of the sea. Had they been waiting in faith, they would not have jumped to this conclusion. This may be the first but would not be the last occasion for mistaken identity. After His resurrection, the Risen Lord was again mistaken for a ghost until He chose to allow His disciples to touch Him and to eat with Him. Ultimately, this challenged them to deeper faith, not just to take the leap of faith and walk across the waters like St Peter, but to accept the deeper truth of the Incarnation, that He indeed was the Son of God. That is what makes the Incarnation both redemptive yet dangerous. On the one hand, God came near. He took on the frailty of human nature, making possible an unprecedented intimacy between Him and us. His resurrection made possible our resurrection. But there is also something dangerous about the Incarnation. The same humanity that enables intimacy can also become idolatry of the self. Instead of the true Jesus, we worship a ‘ghost’ of our own making. Each of us can recognise some aspect of our own humanity in the Lord Jesus Christ, and that is good news, but we can just as easily fixate on that reflexion and exalt it inordinately. When this happens, we are no longer looking at the complete person of Jesus, but only a mirror image of ourselves. The beauty of the Incarnation is that Jesus resembles all of us while resembling none of us. That tension is the secret to really knowing Jesus. The Incarnated Word makes known to us the face of the Invisible God. By sending His Son into the world on Christmas, God upended everything. In revealing the Truth about Himself, He exploded all the false images based on speculation and human projections, overturned all our presumptions and revolutionise the way we should view the world. His Truth calls us to take a step forward in faith, to view things not from our perspective but from His. If this Truth does not change your mind on a regular basis, then the god that you worship is not God. Your god is the convenience of belief.